Background: Hair tensile properties play a crucial role in cosmetology regarding functionality and quality. Commonly, scalp positions are subjected to varying magnitudes of environmental and physical stimuli and correspondingly different hair balding patterns are observed. Aim: This study is aimed at comparing the tensile properties of hair from four different scalp positions and quantifying the differences using statistical methods. Further, the second aim is to investigate the structure–property relationship with respect to the tensile properties obtained from hair in order to obtain a better understanding of the heterogeneous and composite structure of hair. Materials and Methods: Hair samples were subjected to tensile testing and position wise data was compared using relative rating and grey relational analysis. Scanning electron microscopy was used to study the fractography of tensile specimens. Results: The modulus, yield stress, maximum stress, and work of elongation were in the range of 2–6 GPa, 60–190 MPa, 130–340 MPa, and 30–100 MJ/m3, respectively. 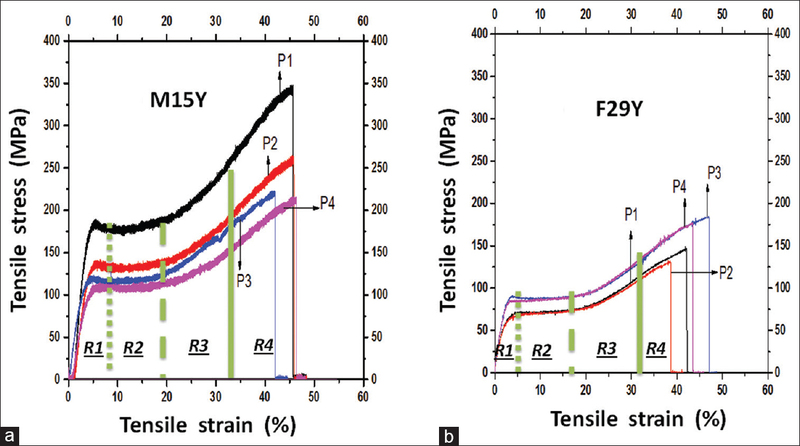 The postyield incremental modulus change at around 33% strain correlated well with fracture features wherein significant macrofibril pullout was observed indicating the fourth region in the stress–strain plot. Conclusion: From the statistical analysis, it was found that there was no significant difference in terms of rating of hair samples from different scalp positions. This may be attributed to the presence of microscopic and nanoscopic structural heterogeneities. The hair fiber is composed of three parts, namely, cuticle, cortex, and medulla [Figure 1]b. A cortical cell, major contributor to the hair tensile properties, consists of macrofibrils and matrix resembling composite structure. Each macrofibril contains intermediate filaments or microfibrils [Figure 1]a. Mechanical properties of α-keratin fibers are primarily dependent on the matrix in which intermediate filaments are embedded. Tensile properties of twisted hair samples revealed that twisting followed by untwisting and giving 10 min time for relaxation has resulted in the properties same as of virgin hairs. However, twisting alone reduced the properties of hair such as moduli, strength, and strain values. Nikiforidis et al., studied hair tensile properties of two age groups considering one scalp position and also studied the properties of one age group (15–20 years) considering two scalp positions (P1-frontal and P4-occipital [Figure 2]a). His group reported the need to consider the viscoelastic behavior of hairs and the importance of linking the modulus ratio and energy ratio to the elastic and viscous behavior of hair, respectively. The physical and tensile properties of hair of pigs with different breed and position (neck and back) were studied and found to be almost similar to human hair and wool despite reporting a lower value of ultimate strain (32%). Slight variation in tensile properties with respect to breed and body position was also reported. Erik et al. reported that the tensile breaking force of hair has not shown any significant dependency on gender, age, and presence of dyes. In another study, no significant differences were observed when tensile properties of hair were compared between vegetarian and nonvegetarian and pigmented and nonpigmented, but slight differences in elongation were observed when hair from young (<12 years) and old (>60 years) samples were compared. It is also reported that beard hair has less tensile modulus compared to scalp hair due to a lower percentage of disulfide bonds. Srinivasan et al. has reported that hardness of water has no influence on tensile properties of hair. Sayahi et al. reported that modulus shows a significant dependency on age, whereas cross-sectional area and maximum load are influenced by “age” and “curl type.” None of the above studies focused on a mechanical characterization of hair from different positions of the human scalp, despite scalp positions being subjected to varying magnitudes of environmental, physical, and hormonal stimuli and correspondingly different hair balding patterns are being observed. Commonly observed baldness patterns reveal low hair density at positions P1 and P3 for men and at position P3 for women [Figure 2]a. In this paper, an attempt has been made to find the tensile properties of human hair collected from four positions of the scalp namely frontal-P1, temporal-P2, parietal-P3, and occipital-P4 [Figure 2]a. The primary objective of this study is to quantify the differences among hair from four different scalp positions based on single fiber tensile tests followed by statistical analysis. Since the tensile properties are obtained due to responses from various structural units of hair such as, crystalline α-keratin, amorphous keratin, α + β keratin, and β keratin, the second objective is aimed to study the stress-strain curves in order to investigate structure–property relationship in regards to hair obtained from various scalp positions. Hair samples from people of five different families with ages ranging from 5 to 41 years were collected from four positions of the scalp. Hair samples were collected from 15 healthy people comprising 9 males and 6 females of Hyderabad, India (Caucasian origin), with their consent, documenting their age and gender anonymously. To reduce the thickness heterogeneity, samples were cut to 2 cm above the scalp from all four positions [Figure 2] and washed with mild shampoo, then with water and dried at room temperature. Minimum of 45 fibers per scalp position were used for tensile testing. For tensile testing of single hair fibers, samples were prepared using paper frame technique as per the ASTM D3379–75 [Figure 2]b,[Figure 2]c,[Figure 2]d. Detail description, including video of tensile test is provided in our earlier publication. The prepared samples were conditioned at 22°C and 55% relative humidity for a duration of 72 h because relative humidity has a large influence on hair tensile properties.,, The prepared samples were then subjected to tensile test (TA-XT Plus, Stable microsystems, UK,) using 500 N load cell. Instrument is located in a room maintained in a controlled temperature of 22°C ± 2°C and relative humidity of 50% ± 6%. Gauge length and test speed were 20 mm and 20 mm/min, respectively. post tensile test, two matching fracture pieces were observed in the stereomicroscope (Olympus SZX7) to see any jaw breaks and slippage from the glue. For successful tests, load (mN)–depth (mm) plots were converted to stress (MPa)–strain (%) plots using fiber diameter and initial length. Diameter of samples prepared for the tensile test was measured using an optical microscope (Metavis U400) in transmission mode. Since the difference in hair diameters between longitudinal (average of three values) and cross-sectional view measurements (after embedding and microtoming) is between 5% and 15%, it was concluded that longitudinal view was acceptable and appropriate. From the stress–strain plots, accurate values for yield stress, modulus, maximum stress, work of elongation, and slope in the postyield region were obtained using Origin software. 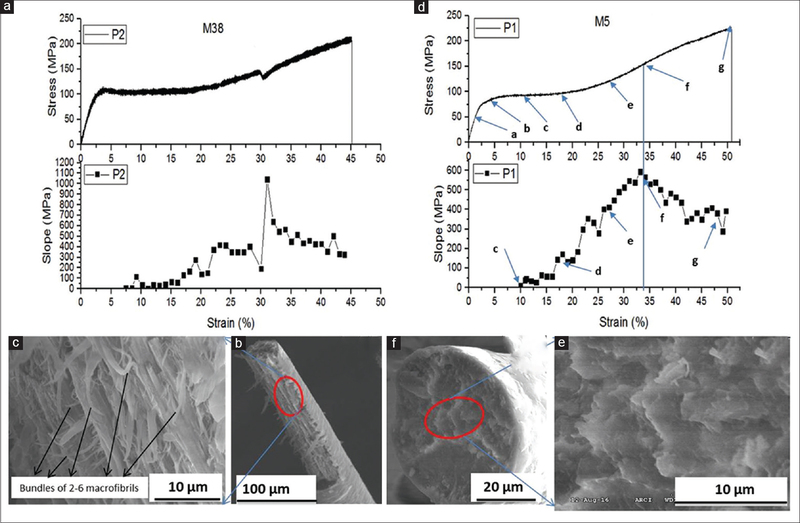 The fractured hair samples were also studied using optical microscopy and scanning electron microscopy (SEM) (Hitachi S-4300 SE/N) to understand the influence of incremental modulus on hair fracture. SEM was used after sputter coating and macrofibril diameters were measured using Image J software (http://imagej.net/Help#Ways_to_get_help). Two different statistical methods were used to conclude the influence of scalp position on hair tensile properties, that is, yield stress, modulus, maximum stress, and work of elongation because these are impacted significantly by hair structure and dynamics. The first method is relative rating [Table 1], which is based on rating the four properties for one position individually (for 15 people) followed by cumulative rating, which involves summation of individual ratings of four properties. In individual rating, a scale of 1–5 was used with 1 and 5 being the lowest and highest set of values, respectively, as shown in [Table 1]. Finally “sum of the rating” is obtained for each position by summation of cumulative ratings. The second method called grey relational analysis (GRA) is used mainly in solving interrelationships among the multiple responses. 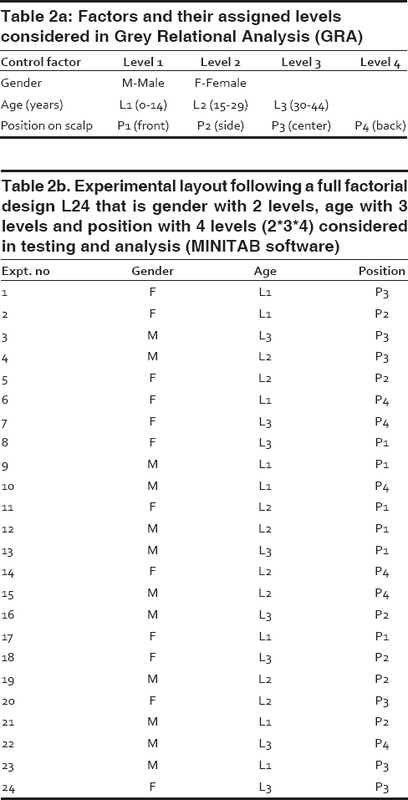 In GRA method, position, age, and gender are considered as factors (input parameters) with levels of 4, 3, and 2, respectively [Table 2]a. Similarly, yield stress, modulus, maximum stress, and work of elongation are considered as responses (output parameters). After determining the number of experiments with full factorial method using Minitab software which was obtained from Qsutra, U/o Cubic Computing (P) Ltd, Bangalore, Karnataka, India, [Table 2]b, GRA was applied to find the optimum factor-level combinations by measuring the grey relational grade for all 24 (levels of 4 × 3 × 2) combinations using four-step procedure described in the literature. Finally “grey relational grade” is obtained for each position, gender, and age group [Table 3]. ANOVA was also used to compare the tensile properties between P1 and P4 positions, but we compared one property at a time such as yield stress with positions. But in GRA, the four properties together (as grey relational grade) can be compared with positions as explained in [Table 3]. Similarly, we can also do such comparison in relative rating method. 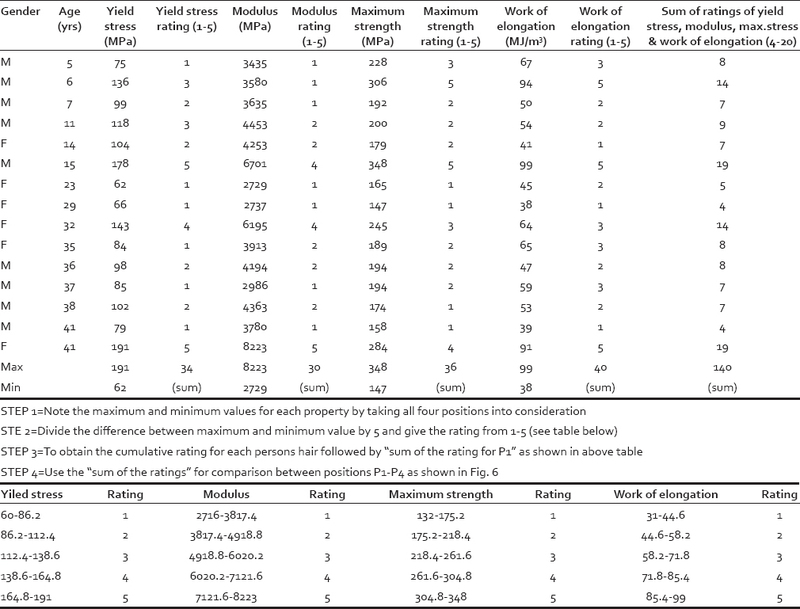 The major advantages of the GRA method compared to relative rating method are that all four tensile properties can be compared with respect to position, gender, and age simultaneously as shown in [Table 2], [Table 3], [Table 4]. In relative rating, comparison needs to be done separately. [Figure 3] represents the stress–strain data with respect to positions P1–P4. For clarity, the data is restricted to two samples (male 15 years, female 29 years) and only representative plots are shown. From the plots obtained, it can be said that stress–strain curves show four characteristic regions (R1–R4) [Figure 3] and [Figure 4]. The first region is a Hookean region from 0% to ~3% strain. The second region is a plateau of constant stress (yield region) in which strain increases significantly without much increase in stress (between 4% and ~18% strain). The third region is a postyield region 1 in which strain increases with stress till about 33% strain followed by fourth region also known as postyield region 2 in which yielding and an ultimate failure occur between ~33% and 45% strain. In the third region, α to β transition continues followed by strain-induced alignment of the β-sheets and continuous increases of postyield modulus until ~33% strain wherein it exhibits maximum slope of 500–700 MPa [Figure 4]. As soon as the slope, that is, modulus in the postyield region starts to decrease; amorphous matrix starts to yield. Although 290–420 MPa of postyield modulus was reported for wool fibers, the reduction of postyield modulus (i.e., change of slope) at around 33% strain was not discussed earlier. In fact, we have seen kinks in few plots at around 33% strain, so we measured slope of the stress–strain plots and correlated with SEM fractographs for almost 20 samples and found that slope decreases consistently at around 33% strain. Full description regarding the fourth region, that is, ~33%–45% strain is provided in discussion part. The tensile properties of all 15 samples with respect to positions P1 to P4 are accurately measured using origin software and mean values were compared (not shown). In addition to mean values, Box-and-Whisker plots were also constructed [Figure 5] to compare the yield stress, maximum stress, modulus, and work of elongation with respect to the scalp positions. The reason for choosing these four properties is that they represent the four regions of the stress–strain curves previously described. 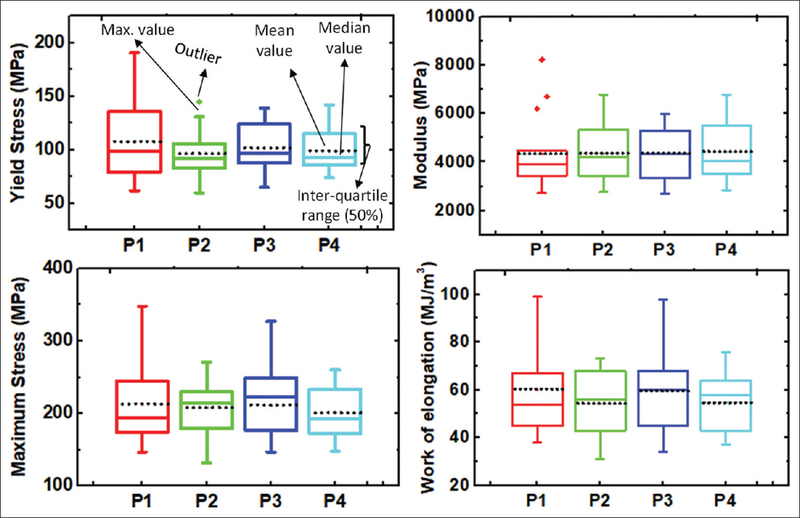 As shown in [Figure 5], Box-and-Whisker plots show no significant differences between positions when mean yield stress values are considered, though hair from P2 position revealed lowest yield stress. Mean values of the modulus were almost same for P1–P4 positions, but the value of the P1 position is dominated by three samples (F41:8223; M15:6701; F32:6195 MPa). A similar trend was observed in the case of maximum stress and work of elongation. Although significant variations in overall range and interquartile range are seen [Figure 5], minimal mean variations between the positions lead to data optimization using two different statistical methods, relative rating and GRA. The two statistical parameters, namely, “sum of the rating” and “grey relational grade” with respect to scalp positions P1–P4 are shown in [Figure 6]. When the “sum of the rating” of the four positions are compared [Figure 6]a, it resulted in slightly higher values for P1, P3 (140, 142) compared to P2, P4 (129, 128) positions. It is found that no significant difference exists between P1 and P4 positions if the limits (60–300) of the “sum of the rating” are considered. 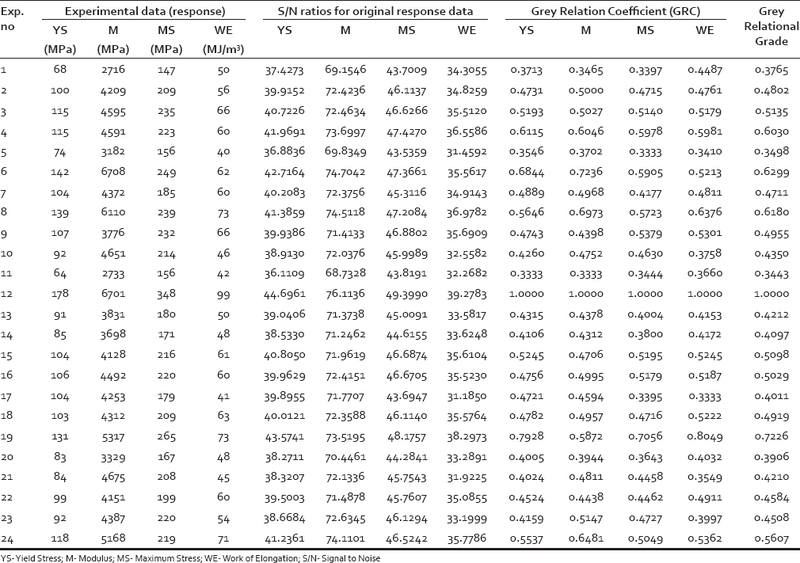 Similarly, from the response graph [Figure 6]b and response table [Table 4] of the GRA method, it can be said that the position is not influencing the tensile properties, because mean grey relational grade, is almost same for all positions (P1: 0.5467; P2: 0.4947; P3: 0.4825; and P4: 0.4857). The “sum of the rating” and “grey relational grade” are not approaching the half limit of their maximum values, that is, 180 and 0.66, respectively, despite following relative rating [Figure 6] indicating the difference between positions is insignificant. Similarly, from the GRA method, it can be seen that “grey relational grade” values [Table 4] are also less influenced by the age group (0–14 years: 0.46; 15–29 years: 0.54; 30–44 years: 0.50) and gender (Male: 0.54; Female: 0.46). From [Figure 7], hair diameters of positions P1–P4 were found to be in the range of 65–90 μm excluding few outliers. One literature reported that aging causes increase in the hair diameter until 20–30 years of life and after which it causes a decrease in diameter, but such trend was not observed in this study. Here, a difference of 10–20 μm in diameter was observed when individual hair diameters were compared between scalp positions (P1 and P4). But average values revealed lowest hair diameter for P4 position (76 μm) and highest hair diameter for P1 and P2 positions (81 μm). 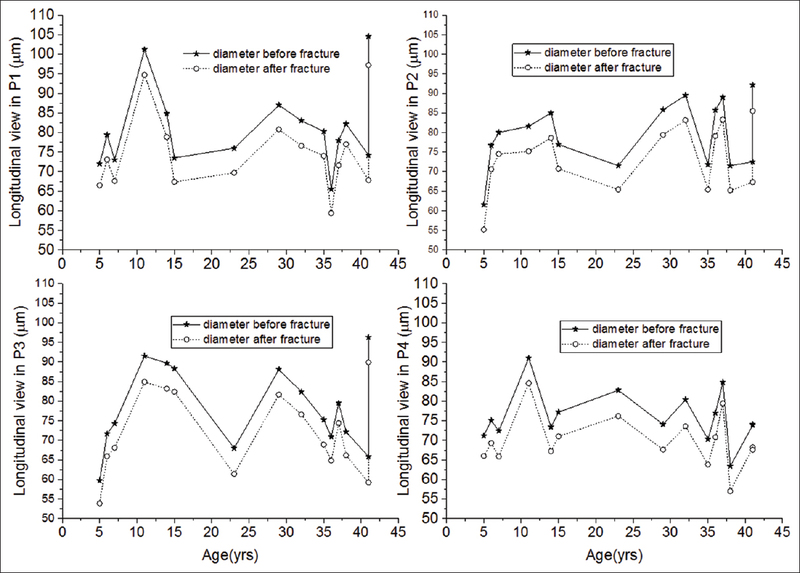 The fact is that age is not correlating with diameter [Figure 7] and also our previous publication ref. 13] due to variation of medulla index and presence of structural heterogeneities. As mentioned in experimental section, stress values (load/area) were considered in analysis instead of load values to avoid the influence of diameter variation. From [Figure 7], it was also found that diameter is reduced by approximately 2 μm irrespective of the position as a result of tensile stretching and it could be due to high Poisson's ratio ~0.8 reported for keratin fiber. Based on tensile property values [Figure 5] and statistical observations [Figure 6], slightly higher mean values were observed for the P1 position. Relative rating method has resulted slightly higher values for P1 and P3 positions [Figure 6]a. Although the difference is not significant, hair from position P4 has lower tensile values compared to other three scalp positions and it is true from experimental as well as statistical observations. Despite having higher diameter for the P1 position compared to other three positions, the slight increase in tensile values for position P1 could be due to the strengthening of the hair composite structure, that is, orientation of the microfibrils and decrease in medulla diameter. From [Figure 5] and [Figure 6], it can be concluded that the proposed relative rating method and GRA are in agreement with observational data despite severe heterogeneity and variability in human scalp hair. The single observation from all three methods (Box-and-Whisker plot, relative rating, and GRA) is that scalp position values are almost same irrespective of “mean value data” or “cumulative sum of the rating” or “grey relational grade” are considered [Figure 5] and [Figure 6]. To support the “mean value data,” we have also carried one-way ANOVA in which P values are found to be 0.76, 0.88, 0.85, and 0.88 when scalp position is considered as source of variation for yield stress, modulus, maximum stress, and work of elongation, respectively. This indicates that scalp position is not able to influence any of the tensile property because P > 0.05. Lack of significant differences in tensile properties between the positions could be due to the presence of micro and nanoscale structural heterogeneities that exists in the hair shaft. This can be explained by assuming hair cortex as nanocomposite in which different alignment structure of rigid intermediate filaments (including the degree of orientation of α helices) could lead to different structural heterogeneities in cortical cells. It can also be due to the negation of data because of heterogeneity and variability due to age, gender, diet, and lifestyle among the samples considered. One study also reported no difference in age and gender when single fiber properties were considered, but no information was given regarding scalp positions. In other literature, slight variation in tensile properties with respect to “position on pig body” was reported, but the study was not restricted to a single area of the body like scalp in humans. Since grey relational grade is considered as multiobjective performance index, mean grey relational grades were also compared for gender and age [Table 4]. No significant difference between the levels was observed, indicating that age and gender are not able to influence the tensile properties like scalp position. From one-way ANOVA analysis, P = 0.73, 0.76, 0.96, and 0.33 when age (between individuals) is considered as source of variation for yield stress, modulus, maximum stress, and work of elongation, respectively. However, the P = 0.037 (<0.05) was obtained for maximum stress when gender was considered as source of variation. As shown in [Table 3], grey relational grade value of 1 was observed for “Male-*Position P1*-age group 15–29 years” indicating that hair collected from this combination can have better tensile properties compared other combinations shown in [Table 2]. The following discussion describes the investigation of structure–property relationship with respect to the tensile properties obtained from hair in order to obtain a better understanding of the heterogeneous and composite structure of hair. Stress–strain plot of a human hair is normally split into three regions,, but the plots are split into four regions in this study [Figure 3] and [Figure 4]. Postyield incremental modulus until ~33% strain is reported in the literature,,, as the third region, but the fourth region, that is, decrease of postyield modulus between ~33% and 45% strain is not discussed earlier. A brief structure–property correlation is provided below considering the cortical cell as a composite comprising of crystalline and amorphous domains for detailed understanding of all four regions and four tensile properties described in this study. The overall work of elongation of the material quantitatively provides responses in regards to all components of the hair sample and that includes crystalline α-keratin, amorphous keratin matrix, α to β transition phase, and β keratin. For specific structure–property description, the stress–strain curves of M15 and F29 are taken as representative plots [Figure 3] and the discussion is as follows. For M15, from the curve at the P1 position, it can be seen that the elastic modulus and yield stress values are the highest and this is an indication that the α keratin is relatively stable and is embedded well in the amorphous matrix. In addition, the curve also indicates that the percentage of crystallinity is highest among the tested samples. For P1, the percentage of strain in the plateau stress region is the lowest and this is followed by a significant increase in the postyield modulus (maximum slope 800 MPa at around 32% strain). This indicates that the degree of entropic response of the amorphous network is low and possibly the amorphous network is a hard elastomer. Postyield, the increased resistance to deformation as observed by the postyield modulus change for all positions (P1–P4) is due to the unraveling of the α keratin to random coil followed by repacking to β-sheet structure and the strain-induced orientation of the same. Further, an additional contribution to resistance due to effective stress transfer between the stable α and β fibrils and the amorphous keratin matrix is possible. In the case of P4 position, the curve indicates lower stability of α keratin, a lower degree of crystallinity, a relatively soft amorphous network resulting in decreased postyield properties (maximum slope is 500 MPa at around 32% strain). In contrast to M15, for F29, the curves for all four regions exhibit a very low stability of α keratin, a low degree of crystallinity, and a very soft amorphous network resulting in highly reduced postyield properties (maximum slope <500 MPa at around 32% strain for all four regions). SEM studies were carried out as only a representation for fiber pullout and second yield (postyield modulus decreases at around 33% strain) and does not contain any statistical value. SEM fractograph of M38 hair with step fracture shows severe macrofibril pullout and fibrillation on the lateral surface [Figure 4]b and [Figure 4]c. Bundle of macrofibrils that have been pulled out as a result of step fracture [Figure 4]c have diameter between 400 nm - 2 μm and lengths between 6 and 15 μm. The step fracture may be influenced by the defects close to the center or medulla. SEM fractograph of M5 sample with smooth fracture [Figure 4]e and [Figure 4]f shows layer pullout and propagation of cracks in the radial direction indicating that defects in the center or medulla region have initiated the fracture. Similar values of postyield modulus (maximum of 600 MPa) were obtained in both cases despite one being step and other is smooth fracture mode because crack initiation happened from the medulla region which is rich in β-pleated sheets. The four tensile properties of stress–strain diagram, Young's modulus, yield stress, maximum stress and work of elongation were considered and statistical ratings were given separately for all four scalp positions P1–P4 using two different methods. In both methods, the overall rating with respect to scalp positions did not show significant quantitative differences and it could be due to the presence of micro and nanoscale structural heterogeneities. NVN Deeksha Reddy, Prof. A.K. Gupta, and Prof. V. Ramakrishna for their extended cooperation and valuable suggestions. Dr. R.B. Adusumalli would like to thank the Department of Science and Technology, Government of India for funding the research. This work was supported under Young Scientist Scheme, Science and Engineering Research Board, Department of Science and Technology, Government of India. Duration of the project was three years (2014-17) and Project No: SB/FTP/ETA-064/2013. Feughelman M. The physical properties of alpha-keratin fibers. J Soc Cosmet Chem 1982;33:385-406. Dankovich TA, Kamath YK, Ruetsch S. Tensile properties of twisted hair fibers. J Cosmet Sci 2004;55 Suppl:S79-90. Nikiforidis G, Balas C, Tsambaos D. Mechanical parameters of human hair: Possible application in the diagnosis and follow-up of hair disorders. Clin Phys Physiol Meas 1992;13:281-90. Nikiforidis G, Tsambaos D, Balas C, Bezerianos A. A method for the determination of viscoelastic parameters of human hair in relation to its structure. Skin Pharmacol 1993;6:32-7. Mohan NH, Debnath S, Mahapatra RK, Nayak LK, Baruah S, Das A, et al. Tensile properties of hair fibers obtained from different breeds of pigs. Biosyst Eng 2014;119:35-43. Erik B, Havitcioglu H, Aktan S, Karakus N. Biomechanical properties of human hair with different parameters. Skin Res Technol 2008;14:147-51. Kavitha S, Natarajan K, Thilagavathi G, Srinivas CR. Effect of oil application, age, diet, and pigmentation on the tensile strength and breaking point of hair. Int J Trichology 2016;8:155-9. Tolgyesi E, Coble DW, Fang FS, Kairinen EO. A comparative study of beard and scalp hair. J Soc Cosmet Chem 1983;34:361-82. Srinivasan G, Srinivas CR, Mathew AC, Duraiswami D. Effects of hard water on hair. Int J Trichology 2013;5:137-9. Sayahi E, Harizi T, Msahli S, Sakli F. Physical and mechanical properties of Tunisian women hair. Int J Cosmet Sci 2016;38:470-5. Batrinos ML. The endocrinology of baldness. Hormones (Athens) 2014;13:197-212. Mishra S, Kunchi C, Venkateshan KC, Gundakaram RC, Adusumalli RB. Nanoindentation and tensile testing of human hair fibers. J Mater Sci 2016;51:10191-204. Robbins CR. Chemical and Physical Behaviour of Human Hair. New York: Springer; 2002. Bhushan B. Biophysics of Human Hair: Structure, Nanomechanical and Nanotribological Studies. Germany: Springer Heidelberg; 2010. Adusumalli RB, Muller U, Roeder T, Weber H, Sixta H, Gindl W. Tensile testing of single regenerated cellulose fibres. Macromol Symp 2006;244:83-8. Kurra S, Regalla SP. Multi-objective optimisation of single point incremental sheet forming using Taguchi-based grey relational analysis. Int J Mater Eng Innov 2015;6:74-90. Krishnaiah K, Shahabudeen P. Applied Design of Experiments and Taguchi methods. New Delhi, India: PHI Learning Private Limited; 2012. Feughelman M. Natural protein fibers. J Appli Polym Sci 2002;83:489-507. Jeong KH, Kim KS, Lee GJ, Choi SJ, Jeong TJ, Shin MK, et al. Investigation of aging effects in human hair using atomic force microscopy. Skin Res Technol 2011;17:63-8. Samanta A, Bhattacharya M, Dalui S, Acharya M, Das PS, Chanda DK, et al. Nanomechanical responses of human hair. J Mech Behav Biomed Mater 2016;56:229-48. Antunes E, Cruz CF, Azoia NG, Cavaco-Paulo A. Insights on the mechanical behavior of keratin fibrils. Int J Biol Macromol 2016;89:477-83. Miserez A, Wasko SS, Carpenter CF, Waite JH. Non-entropic and reversible long-range deformation of an encapsulating bioelastomer. Nat Mater 2009;8:910-6. Kreplak L, Doucet J, Dumas P, Briki F. New aspects of the alpha-helix to beta-sheet transition in stretched hard alpha-keratin fibers. Biophys J 2004;87:640-7. Hearle JW. A critical review of the structural mechanics of wool and hair fibres. Int J Biol Macromol 2000;27:123-38.